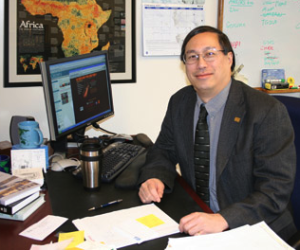 This post is by Bob Chen, Director of CIESIN (Center for International Earth Science Information Network), Columbia University, former Secretary General of CODATA and current co-chair of the GEO Data Sharing Working Group. Representatives of more than 80 governments and 100 participating organizations are gathering in Geneva this week to renew their commitment to GEO, the Group on Earth Observations, a voluntary intergovernmental initiative launched in 2005, and to agree on plans for the next decade. A key aspect of GEO has been to widen the consensus on the need for open sharing of Earth Observation and related spatial data and to implement data sharing mechanisms within GEOSS, the Global Earth Observing System of Systems. CODATA has played a leadership role in GEO’s data sharing efforts since 2006. The GEOSS 10-year implementation plan adopted in 2005 had outlined a set of Data Sharing Principles (DSPs) for data sharing across the GEO community, but translating these principles into practice required agreement on terminology, consensus on processes and procedures, and inputs from experts on legal and intellectual property issues. As an interdisciplinary committee of the International Council for Science (ICSU), which was and still is a GEO Participating Organization, CODATA volunteered to lead the initial data sharing task and organized an expert meeting at its 2006 CODATA Conference in Beijing. In 2007, CODATA led development of a white paper that reviewed past experience with data sharing principles and policies and drafted specific guidelines for implementing the DSPs. Based in part on these efforts, the 2007 Ministerial Summit in Cape Town affirmed the need to reach a consensus on the implementation of the DSPs by the next Ministerial in 2010. The 2008 GEO-V Plenary in Bucharest elevated the original GEO data sharing task to a higher-level Task Force with a mix of governmental and Participating Organization members. CODATA continued to represent ICSU as one of the co-chairs of the Data Sharing Task Force, and played a key role in revising the proposed implementation guidelines. In September 2009, a version of the white paper, Toward Implementation of the Global Earth Observation System of Systems Data Sharing Principles, authored by Paul Uhlir, myself, Joanne Gabrynowicz, and Katleen Janssen, was simultaneously published in the CODATA Data Science Journal and the Journal of Space Law. The paper provided detailed justification for the GEOSS Implementation Guidelines that were subsequently accepted at the GEO-VI Plenary in Washington DC in November 2009. Recognizing that implementation guidelines were only a partial step towards implementation of the GEOSS DSPs, GEO recognized that more specific actions needed to be taken by GEO collectively, by individual Members and Participating Organizations, and by specific GEOSS tasks and cross-cutting activities to move towards full and open access to key data within GEOSS. The Task Force therefore developed a detailed Action Plan that was adopted at the GEO-VII Plenary in Beijing in 2010. A key element of the Action Plan was for GEO to create the GEOSS Data-CORE—the GEOSS Data Collection of Open Resources for Everyone—consisting of a distributed pool of documented datasets, contributed by the GEO community on the basis of full and open unrestricted access and at no more than the cost of reproduction and distribution. The Action Plan also identified a range of other implementation actions and established a Data Sharing Working Group (DSWG) to continue the work of the Task Force. CODATA continues to play a lead role in the DSWG, serving as one of six co-chairs, contributing substantial expertise on issues such as legal interoperability and data sharing frameworks, and helping to organize side events and other supporting activities. With the end of the first 10-year implementation period in sight, and in light of rapidly growing recognition by governments and the wider community of the benefits of open data sharing, there is increasing awareness within the GEO community to the potential not only to further implement the existing GEOSS DSPs but also to expand the range of open data sharing efforts across a range of societal benefit areas. 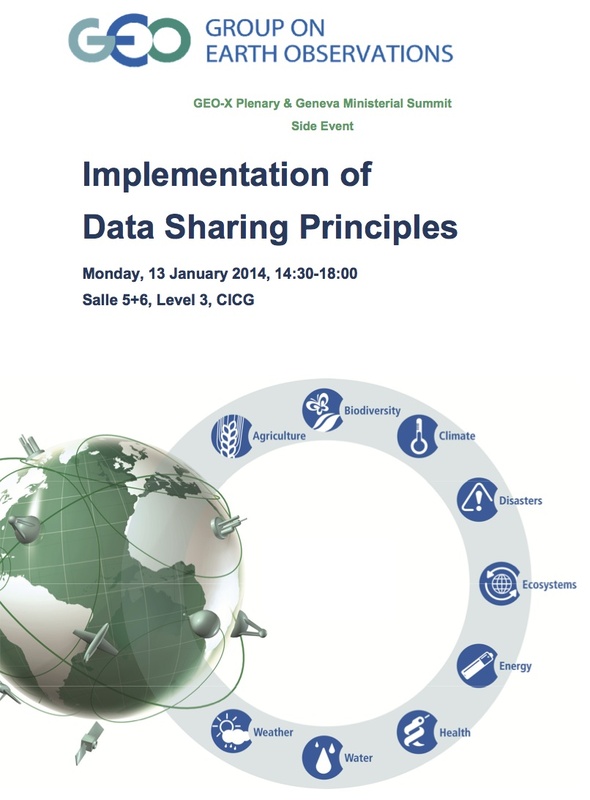 The DSWG has organized a side event at the GEO-X Plenary that is highlighting a number of new data sharing initiatives and improvements in capacity for data sharing at national, regional, and global levels. Simon Hodson and I are also members of the ICSU delegation at the GEO-X Plenary. I will be working with Simon to report on the side event in more detail and on outcomes of the GEO-X Plenary and Ministerial Summit related to data sharing in upcoming blog entries. This entry was posted in Uncategorized on January 13, 2014 by codata_blog.